Previously I shared that my dad “pimped our van” back in the 70’s. Besides his mad van designing skills, Dad took on many home improvement challenges with his kooky, innovative mind. For example, Dad could fix just about anything with a twist tie and duct tape. ANYTHING, people. Plumbing, electric, automobiles. We had a junk drawer with a plastic bag full of twist ties just for this purpose. He was a handy guy: the MacGyver of the Mid-Atlantic Region. Since we lived in a small, aging home, Dad’s challenges never ended. Our cape cod had one bathroom– a tiny, one-person bathroom with one cabinet under the sink. Remember, too, that it was New Jersey in the 80’s and Mom and I were fully immersed in 80’s style, including the Big Hair trend. Mom and I both had full heads of long, thick hair, which required hair accessories, giant cans of hair spray, and various other hair products for teasing and lifting. With one bathroom between the four of us, Dad had his work cut out for him with the Bathroom Challenge. He utilized his designing and fixing skills to help us out the best he could. Of course, the first thing he did was hang flashy silver wallpaper and purchase brown mats and accessories. Stylish, right? He added a special drain in the shower to catch all of our hair. He hung surge protectors and shelves and hooks for hair dryers and curling irons. We even had a radio to listen to during our hair styling sessions. The one thing he couldn’t contain, however– Makeup. Mom had her dorky set of grown up makeup, and I had my cool, teenager makeup. Makeup bags sat on the back of the toilet, took up shelves, and overflowed to our bedrooms. There was makeup all over the place, and our little bathroom just couldn’t keep up with our purchases. The Challenge: Contain the Makeup! After analyzing the possibility of using duct tape and twist ties and finally admitting defeat, Dad came up with an amazing idea. He emptied his tackle box and put Mom’s makeup in it. I remember that her tackle box of makeup was UH-GLEE. Brown and smelly like the pond. But, it worked out great for holding her various sized tubes and palettes (and I’m sure Dad used it as an excuse to buy a new tackle box for himself). Recently, I remembered the Tackle Makeup Box and checked out Amazon. I found the cutest tackle box– apparently they make them girly now too. LOOK how awesomesauce! 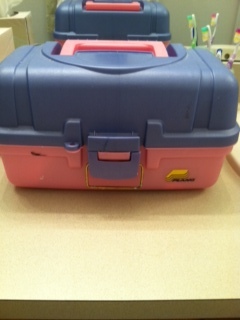 My Tackle Makeup Box is totally rad. Its shelves are perfect for separating eyeliners from lipliners, eyeshadow from blush, tweezers from q-tips, and the open bucket area on the bottom is perfect for those larger items (such as my beloved Kat Von D eyeshadow palette and my Sephora foundation brush). 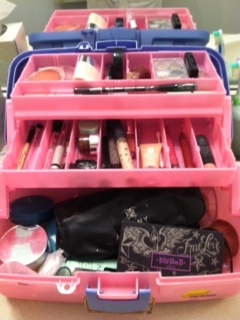 If you have enough counter space for a Tackle Makeup Box, I highly recommend purchasing one. It sure beats digging around a bottomless makeup bag for that special lip gloss or liner. You can see everything laid out in front of you, your hands don’t get messy from searching the bag and rubbing against open products, and your morning beauty routine moves a lot more smoothly. If you have kids, you can clasp it shut– it’s a lot more difficult for little hands to open a tackle box than unzip a makeup bag. Thanks, Dad, for applying your innovative MacGyver mind to the Women’s Beauty Product Cause. Maybe we should call you Max Factor instead. Have a nice evening! Going to work on Project Z now. And you have his genes..,and I need a new tackle box!! Another Awesomesauce moment! Real cewl.! Ah! Love your makeup box. If I wore makeup I would buy one. Huh. Maybe that really cool tackle box will be the thing that gets me to doll myself up! It may be the thing you need. I hope you doll up for The Fur Ball :). You can borrow my makeup. LOL – these were very popular when I was in high school – kit ‘n caboodles I believe they were called – or something like that. we called them Caboodles. And they were stuffed full of blue and purple eye shadow and multiple colors of mascara! Oh, and glitter. tons of glitter! Now a days, I’m all about how small can I go and still indulge in my need to have it all organized! LOL – Only during the 80’s could we get away with all that style all at the same time!! YES. 80’s style also deserves its own post! Ahh, a false-MacGyver. He was a special dude. Not everyone can dismantle a bomb with pair of tweezers and a piece of gum… Haha. I was a big fan of train case which many makeup artists and YT makeup gurus possess but this is way cuter! I was thinking of you as I wrote that post and hoping you would comment! I am glad you liked it. It is really convenient. You may NEED one! Did you? *blush*. Thanks Jess.